Valid in over 150 countries, this document bears your photo and is valid for one year and enables you to drive overseas. 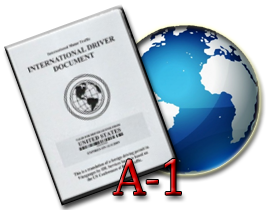 A-1 Passport highly recommends traveling overseas with an International Driving Permit. Even if you do not intend to drive during your travels, this is a highly acknowledged form of identification that will prove useful in dealing with foreign authorities or as a second form of identification.